Human neurobrucellosis has a broad spectrum of clinical manifestations depending on the stage of the infection and affected part of the nervous system. Neurobrucellosis is the second most common and severely debilitating complication of the systemic brucellosis and may occur at any stage, even years after and without the sytemic symptoms. 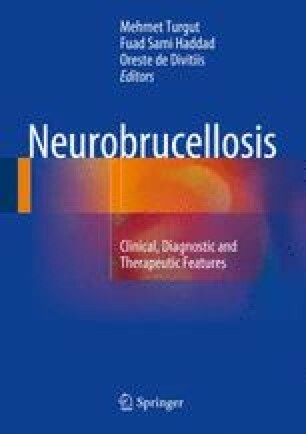 Clinically, neurobrucellosis can present in an acute form as meningitis, meningoencephalitis, myelopathy, or neuropathy; in chronic form as granuloma, demyelinization, or degeneration; or in any combination of these. In this chapter, we analyze the etiology, physiopathology, clinical picture, diagnosis, and management of intramedullary brucellosis in detail.